On the 23rd anniversary of the Wayne Gretzky sale trade, it’s only natural to take a look back at the trade’s importance on the league. Stephen Brunt wrote a good book about the entire deal in “Gretzky’s Tears” and Peter Pocklington was able to get his side of the story to the public in an even better effort: “I’d Trade Him Again: On Gretzky, Politics, and the Pursuit of the Perfect Deal.” Plenty has been made of what the trade meant for Sunbelt hockey, the Edmonton Oilers, and Canadian hockey as a whole. But what gets lost in the mix is the immeasurable impact Gretzky’s trade had on the local Southern California market. Outsiders understand that it was a big trade—but people don’t quite understand how it completely shifted sports landscape of the entire region. The obvious, immediate impact was at the box office. From his first game of Gretzky’s first season in Los Angeles, attendance at the Forum skyrocketed to levels that only Bruce McNall had dreamed of. Gretzky was the biggest name in a game that was still a regional sport in the United States. People may not have known about offsides, line-changes, or icing—but they knew about Wayne Gretzky. Instantly, he put the Kings on equal footing with Magic and the Lakers, Gibson and the Dodgers, USC football, UCLA basketball, and whoever the Raiders/Rams were trotting out onto the field. The team had a marquee name—more importantly, they had the only name in hockey that could transcend all sports and entertainment. Might not be the greatest joke from Kirk Cameron’s on-screen Dad, but it was painfully true. But everything changed when the Kings had their own superstar to grab the sports headlines away from the teams that dominated the LA sports landscape at the time: Lakers and Dodgers. In the year before he arrived, the Kings averaged only 11,667 fans per game. In his first year, attendance shot up 27% to 14,667 fans per game. In the six consecutive playoff appearances for the Kings after Gretzky arrived, there wasn’t an empty seat for even a single game. The attendance peaked in 1991-92 when the Kings sold out every single game of their 40 game schedule. Not bad for a team that was used to playing to two-thirds capacity in the mid-1980s. The Kings finished the 1987-88 season with a 30-42-8 record that was good for 18th in the 21 team NHL. In the year before Gretzky’s arrival, the Kings were 5th in the league in scoring—but dead last in defensive. Gretzky was expected to bring more than just a boatload of points; he was expected to bring wins. Just important as the success in the stands, was the success on the ice. 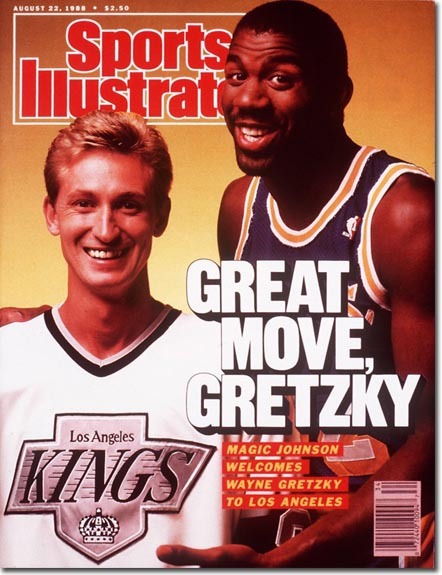 In the three seasons before Gretzky arrived in LA, the Kings had averaged 64 points per season. In the three seasons after he arrived, they averaged 89 points (including the second best record in franchise history in 1990-91). The Kings went from a near .500 team at home to one of the more difficult places to play. Did the fans show up because they won? Or did they win became more people showed up? Most likely it was a little bit of both. “Looking back to before I started writing about the Kings and the NHL, I was a fan of The Great One and had been since his days with the Oilers. I remember back in those days that whenever the Kings and Oilers were on TV, I would make sure to get home and watch so I could marvel at his extraordinary skill—talent that we had not seen before. And after Gretzky was traded to the Kings, I rarely missed a game on television. I was in attendance at the Great Western Forum on March 23, 1994, when Gretzky broke Gordie Howe’s career NHL goal-scoring record against the Vancouver Canucks. I remember leaping to my feet, arms raised high over my head, cheering loudly along with everyone else. What a great memory that was. But most obviously, the biggest change to the hockey landscape in Southern California was the addition of another team. Before Gretzky arrived, hockey fans were usually transplants that had two choices: the Kings or the team from their old hometown. Often times, they chose the latter. With the buzz Gretzky created in the media, the success the Kings achieved on the ice, and McNall’s willingness to open his market (for a one-time cash grab), the Mighty Ducks of Anaheim were born. Fans in Orange County and the Inland Empire suddenly had a much closer option to satisfy their hockey fix. Ticket prices had exploded as demand increased for the Kings—there were a segment of season ticket holders who jumped at the chance to cut down on their tickets prices and drive time. It’s been a divided region ever since. Hard to believe that a region that had a hard time supporting a single team for two decades was able to add a whole new franchise only four years after his arrival.